This article provides in-depth fundamental analysis of Hindustan Media Ventures Ltd, a 75% subsidiary of HT Media Ltd and publisher of Hindi newspaper: Hindustan. Q: Dear Vijay, You have a great blog! I love the clean and logical analysis of the various companies featured. I would like you to look at Hindustan Media Ventures Ltd (HMVL). Hindustan Media Ventures Ltd was spun-off from HT Media in 2010. HMVL publishes the popular Hindi daily “Hindustan” which has number 1 market share in Bihar and Jharkhand and number 2 in UP, Punjab, Delhi and Uttarakhand. Unlike the western world, newspapers are a thriving business in India and especially the ones published in Hindi or other local languages. Note: Increasing net margins and profit growth higher than sales growth indicating operating leverage. Note: Hindustan Media Ventures Ltd has negligible leverage. Asset turnover has decreased a bit but increasing net margins have compensated for it and translated into higher return ratios. ROCE is higher than ROE because a large part of the balance sheet is in cash and marketable securities. Note: Profits are getting converted into cash. Note: SSGR higher than actual growth indicating no need to raise external funding. Note: Hindustan Media Ventures Ltd has higher growth, better margins and less D/E ratio than peers. The industry overall seems to be very profitable which is a good sign. HMVL can boost it ROE by returning cash to shareholders through buybacks or dividends. Note: Hindustan Media Ventures Ltd certainly seems to be growing sales and profits faster than peers and yet available at a lower valuation. The Earnings yield provided by Hindustan Media Ventures Ltd is around 8.5%, which is similar to that provided by fixed deposits in India. This yield could grow at 15-20% rates over next few years and handily outperform the fixed deposits and inflation. The market price does not seem to be accounting for growth and we are getting it mostly free. Hindustan Media Ventures Ltd is part of the HT Media group, was spun out because of its higher growth trajectory and better return ratios compared to the more competitive English daily business. This shows the willingness of management to highlight the value of Hindustan Media Ventures Ltd through corporate restructuring. This is a good sign. The biggest risk is what they will do with the massive amounts of cash Hindustan Media Ventures Ltd generates. A share buyback might be difficult because 75% shares are owned by HT Media. The management has recently mentioned an upper threshold of INR 400 crores for cash on balance sheet and has mentioned the willingness to hike the dividend if they cannot find a good acquisition target by the end of the year. I would love hear your thoughts and analysis of Hindustan Media Ventures Ltd through your blog. Thanks for your feedback and appreciation! I am happy that you have pointed out important parameters for analysis of Hindustan Media Ventures Ltd along with the comparison with industry peers. 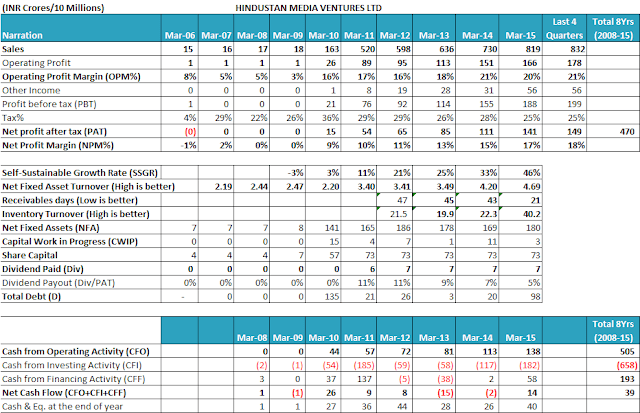 Your analysis is very helpful for anyone wishing to analyse Hindustan Media Ventures Ltd as an investment opportunity. Mohit, I thank you on behalf of all the readers of www.drvijaymalik.com for the time & effort put by you in your analysis. 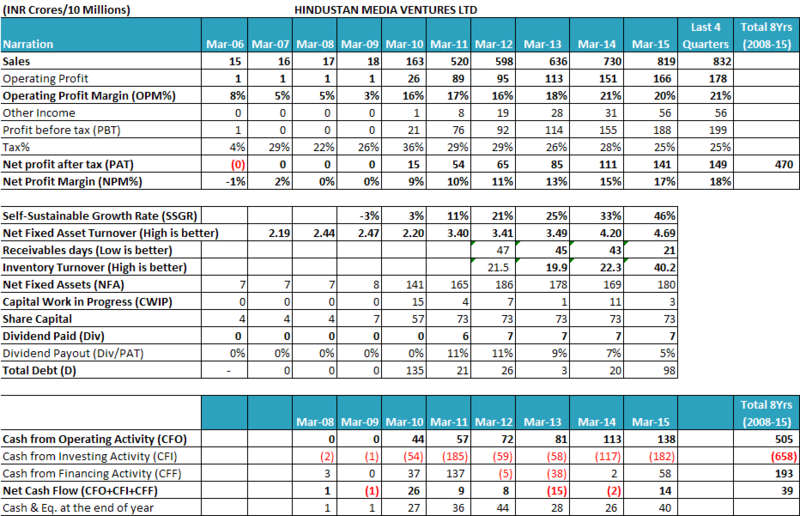 Let us now analyse the financial performance of Hindustan Media Ventures Ltd for past 10 years. Until 2009, Hindustan Media Ventures Ltd was primarily acting as a printing agent for its parent company HT Media Ltd. It used to print various publications like Hindustan Times and Hindustan and therefore Hindustan Media Ventures Ltd as an outsourced contractor, had lower revenue levels of about INR 15-18 cr over the years. However, in 2009, the Hindi businesses from HT Media Ltd including Hindi daily newspaper, Hindustan, Ravivasriya Hindustan; magazines Nandan and Kadambini; were transferred to it. Therefore, from 2009, revenues of Hindustan Media Ventures Ltd have grown by leaps and bounds in line with other media publishing houses. In last 5 years, revenue of Hindustan Media Ventures Ltd has grown at a very healthy annual growth rate of 35-40%. More important is the fact that this sales growth has been accompanied by improving profitability. Operating profit margins (OPM) of Hindustan Media Ventures Ltd improved from earlier 3-5% and are now consistent at 18-20%, and have been showing improvement over past 5-7 years. Similarly, net profit margins (NPM) have also improved from near losses in pre 2009 times and have continuously improved from 10-11% in 2009-10 to 17-18% in 2014-15. Sales growth with improving profitability margins is the first sign of any exciting investment opportunity. Hindustan Media Ventures Ltd has been currently paying taxes at 25-28% rate, which is lower than the standard corporate tax rate in India. An investor needs to analyse the tax payments by the company and find out the reasons for lower tax payout ratios of Hindustan Media Ventures Ltd.
Hindustan Media Ventures Ltd has changed its business activity from primarily manufacturing activity of printing newspaper to a full-fledged media house with predominantly advertising revenue. Therefore, the standard parameters of operating efficiency, Net Fixed Asset Turnover, Inventory Turnover Ratio and Receivables Days are not highly relevant for it. Nevertheless, over the years, Hindustan Media Ventures Ltd has been reflecting improved operating efficiency. This is shown by increasing fixed assets turnover and inventory turnover. Net fixed assets turnover has improved from 2.2 in FY2010 to 4.69 in FY2015. Similarly, inventory turnover ratio has improved from 19.9 in FY2013 to 40.2 in FY2015. Improving asset and inventory turnover indicate that Hindustan Media Ventures Ltd is able to use its capital more efficiently and generate higher sales from same level of assets. Hindustan Media Ventures Ltd has been able to convert its profits in to cash flow from operations. PAT for last 8 years (FY2008-15) is INR 470 cr. whereas the CFO over the similar period is INR 505 cr. This is another healthy good sign. The ability of Hindustan Media Ventures Ltd to collect money on time is visible from declining receivables days as well. Receivables days of Hindustan Media Ventures Ltd have decreased from 47 days in FY2012 to 21 days in FY2015. Self-Sustainable Growth Rate (SSGR) of Hindustan Media Ventures Ltd is about 40-45% currently. SSGR has been increasing year on year due to continuous increase in profitability and net fixed asset turnover. Even though SSGR is primarily useful for manufacturing businesses, nevertheless, high SSGR value for other industries also provides some comfort to investors by indicating robustness in the business model. High SSGR of 40-45% seen in association with good working capital management indicates that Hindustan Media Ventures Ltd does not require additional debt to sustain its current growth rate of 30-35%. On the contrary, Hindustan Media Ventures Ltd has been generating excess cash than what can be absorbed in existing business operations, which is visible ballooning cash position of the company. At March 31, 2015, Hindustan Media Ventures Ltd had cash reserves of INR 587 cr (Non-current investments INR 459 cr, Current investments INR 88 cr and Cash & equivalents INR 40 cr). High cash position would usually indicate that any company would want to retire debt and improve its profitability further by reducing interest costs. However, short-term borrowings of Hindustan Media Ventures Ltd increased by INR 78 cr from INR 20 cr in FY2014 to INR 98 crore. Investors need to understand the requirement to raise debt while the company has surplus cash available with it and whether the fresh debt raised is at very attractive pricing terms so that Hindustan Media Ventures Ltd can play arbitrage between the loan funds and its liquid investments. Playing arbitrage between various sources of funds is a treasury operation, which should be avoided by companies in non-financial sectors. Such companies should use funds to invest in their core or related business lines. Hindustan Media Ventures Ltd does not own the brands of its publications like Hindustan. These brands are owned by its parent company HT Media Ltd. From the analysis of financial statements of Hindustan Media Ventures Ltd, it seems that it used to pay a token license fee of INR 1 lac (INR 0.01 cr.) to HT Media Ltd (Page 74 of FY2015 annual report of HMVL). However, now the company plans to buy these brands from HT Media Ltd at a cost of INR 62 crore. Payment of INR 62 cr to HT Media Ltd would reduce HMVL expenses by INR 1 Lac every year but it will decrease the non-operating income on its investments by about INR 6 cr every year assuming about 10% return on its liquid investments. In FY2015, Hindustan Media Ventures Ltd earned INR 56 cr. from its liquid investments of INR 587 cr (9.5% returns). Investor should keep an eye on the utilization of cash by Hindustan Media Ventures Ltd in future to notice the signs of value adding or squandering steps as a part of their monitoring exercise. Hindustan Media Ventures Ltd has been paying regular dividend to its shareholders. It amounts to sharing the fruits of growth with shareholders. These are signs of a shareholders’ friendly management. However, the investor should note that the dividend payout ratio, which indicates the share of profits that is being paid out as dividends has decreased over the time from 11% in FY2012 to 5% in FY2015. Hindustan Media Ventures Ltd is currently available at a P/E ratio of 11.9, which offers Ltd margin of safety as described by Benjamin Graham in his book The Intelligent Investor. Overall, Hindustan Media Ventures Ltd appears to be a company growing at a fast pace, with improving profitability margins & operating efficiency. It is generating cash at a higher rate than it can consume, which has resulted in accumulation of significant cash surplus with the company. However, Hindustan Media Ventures Ltd has reduced its dividend payout ratio year on year, which seems counterintuitive looking at the increasing cash reserve. An investor should keep a close watch on its deployment of cash as that seems to be the most critical thing currently. It remains to be seen whether the decision to give INR 62 cr. to parent company as consideration for brands would be beneficial for Hindustan Media Ventures Ltd shareholders. These are my views about Hindustan Media Ventures Ltd. However, you should do your own analysis before taking any investment related decision about Hindustan Media Ventures Ltd.